Here is another set of blocks I am playing with. I started off with this cool jelly roll. I had seen a block like this on Jeni Baker’s site and wanted to give it a try. However rather than using white as the background, I wanted to use a busy looking fabric just to see what it would look like. 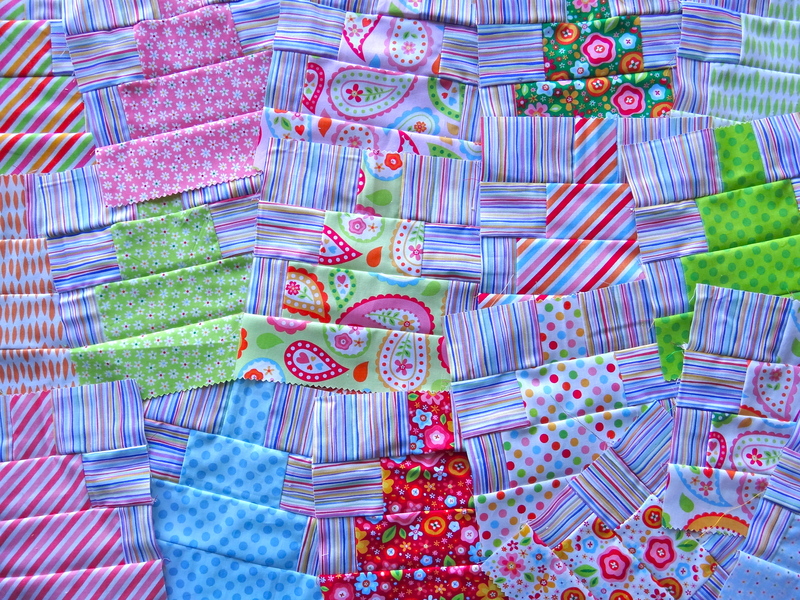 I have finished half of the blocks and I think the striped background fabric adds some fun energy into the block. I am about halfway done with the blocks and am looking forward to making more! They look like tiered cakes to me;) Maybe because I jsut had a kids B-day party at my house this past weekend with a tiered cake LOL Nonetheless they are really awesome blocks!! Hi Sara – how funny – i also think they look like little cakes! And I have not even been to birthday party recently! I think the colors lend themselves to cake thoughts as well… Makes me want to have a cupcake or something!! Have a great day. These look rather lovely. I like the fabrics! I love it… Of course, I love everything you create. Hi Diana – 🙂 Your comment made me smile! ← Minky Takes the Chill Out!